My wife was watching Riverdale the other day, and I caught bits and pieces of it. Basically, Archie was being tried for murder. Now, ignoring how this is a ludicrous adaptation of the source material, lets look at what was actually going on. Archie was being tried for first degree murder and first degree murder only. That means that there had to have been mens rea, or for the layman, malice aforethought. It needs to be proven that it was premeditated. First degree murder is notoriously the hardest charge to prove, which is why they usually also consider a second degree murder or voluntary manslaughter. But not here! Without any motive (or weapon!) the prosecution still pushed for first degree murder only. Basically, the prosecutor is the worst lawyer ever, and a sever waste of taxpayer money. Then, despite being on trial for willful premeditated murder, the court lets Archie out for an extended weekend while the trial is going on. NO JUDGE WOULD EVER ALLOW SOMEONE TO POST BAIL FOR MURDER ONE (at the very least, make him use a tracker or something). The jury comes back stuck at 6-6. Now with such a split, any prosecutor would not try the case again (maybe if there were one or two jurors leaning the other way, but not HALF OF THEM! ), but this one says that she’s going to try the case again. Yeah, I’m a lawyer, but you don’t have to be a lawyer to pick up on how ridiculous all this is. And all of this could’ve easily been fixed with some tweaks, provided that the writer actually did some research. It’s not like you have to go to the library to look this stuff up anymore. We have the internet now. All it takes is a click. So please, when you’re writing in an area that you don’t have intimate knowledge of, please do some research. Even a cursory glance at a Wikipedia page will keep you from looking like an idiot. Wow. It’s been a while, hasn’t it? Despite the lack of posts, I haven’t been sitting around on my hands doing nothing. So where’s the second Spark book? Well it’s written. It was written a while ago. But I don’t like it. I still like the first half, but something about the second half just wasn’t clicking. Every chapter was a chore, and I still don’t know how I feel about the ending. I’m going to have to completely rewrite at least half of the book. So it hasn’t been released yet, and it won’t be for a while. Since A Spark Ignites had an actual ending and didn’t leave any loose ends, I don’t feel pressured to release a sequel as soon as possible. A Spark Ignites is a stand-alone book, and while I’m sure some people would love a sequel, it just doesn’t need one. So for the time being, Spark 2 will sit as a file on my computer. I hope to return to it eventually, but right now I have other things on my plate. Being a lawyer is time consuming, as is being a father and husband. It’s hard to find time to write. That doesn’t mean I’ve stopped. I’ve been working on another book unrelated to Spark. Several of them, actually. I recently finished a fourth draft of one, and started writing another, not to mention I have several more books outlined. I won’t be releasing anything anytime soon though. Unlike A Spark Ignites, these books are part of a series, and I’ve learned my lesson with Spark. Until I have a number of books finished, I don’t plan on releasing any of them. I’d prefer not to force people to wait years in between books. So yeah, just letting you guys know I’m still alive, still writing. You’ll see stuff from me eventually. Just bear with me please. Yeah, I haven’t been posting much lately. There’s a reason for that. The past few months have been very busy for me. First, there was the bar exam, and intense two day test that I spent months preparing for. Then I had to find a job to support me, my wife, and our daughter. Then I had to spend time either helping take care of my father-in-law, or spending time watching my daughter so my wife could. Then my computer broke (and every time I get it back, something else seems to be wrong with it. Hopefully the next time I get it back, it’ll be in working order). I was busy and stressed, and frankly I couldn’t get much writing done, and didn’t care to. Then my father-in-law passed away. I was close to him, and loved him like my own father, so this hasn’t been the easiest time for me. I can honestly say that he was the best man I’ve ever known. It’s been barely two weeks since he passed, and it still feels raw. I’ve found myself writing more now, if only to express my emotions, to find some way to let them out. I keep on thinking back to the times I could have spent with him, but didn’t, often for my own selfish reasons. It’s hard not to dwell on such things. So I’m not going to lie and say that I’ll be updating this blog every week. I honestly don’t know when the next time will be. Right now I’m just going to focus on my life, my family, and my writing. But I will try to post here more often. But for the time being, don’t expect it to be a regular thing. Check out another review of A Spark Ignites! Synopsis- Matt Stone is an average high schooler. That is, until his brother unexpectedly dies in a car accident, his last words to Matt cryptically tell him to keep the legacy. His legacy, it turns out, is that of the superhero Spark. Matt feels compelled to take up the job, even if he doesn’t want to, out of honor for his brother. But what if Matt’s brother dying wasn’t an accident? What if there was foul play involved? Death is common in fiction, just as it is common in life. It is the highest of stakes, even though ever character, just like you and everyone you know, will end up dead eventually. Different people react to death, or even the possibility of death, in different ways. Fear is the most common emotion associated with it, but it isn’t one that everyone experiences. Until my child was born, I never feared for my own death. I did, however, fear the deaths of others. There’s an elderly British man in his eighties who I was fairly close with about eight years ago. We met while I was spending a year abroad, and often had philosophical discussions. Over time, we’d fallen out of touch. Yet whenever I feel the desire to call him and find out what he’s up to, I hesitate. I’m scared I’ll find out that he’s not around anymore, and as long as I don’t call, as long as I don’t know his status, I can tell myself that he’s probably still alive. Because death is a universal experience, it is bound to come up in your writing at some point. When it does, try to remember that not everyone has the same reaction, and not everyone faces death the same way. I remember my grandmother, a holocaust survivor, telling me that after the murder of her family, she no longer wanted to live. She was jealous of people that didn’t wake up in the morning. When she finally did pass away, I think she viewed it as a relief. Death was something she welcomed. My father realized this, and yes, he mourned her loss, but at the same time he found a sense of peace, knowing that her suffering on this world was finally over. There’s a book, A Brush With Death : An Artist in the Death Camps, by Morris Wyszogrod (or Moshe, as he was called by his friends). The book recounts the author’s experiences in the Holocaust, and actually bears a few similarities to Yossel, something I pointed out to author Joe Kubert when I had the opportunity to meet him, a year before his death. Of course, Moshe Wyszogrod isn’t around anymore either. Few survivors are. But what makes his book unique isn’t just that it is an account of death and horror, recorded as experienced by someone who faced it day in and day out for years, but rather because of a few paragraphs written here and there, throughout the book. The author mentions a friend of his, who he met in the Warsaw Ghetto, entered into the concentration camps with, and eventually was separated from as the war went on, only to be reunited in America with years later: Mayer Lachman. My grandfather didn’t talk much about his experience in the Holocaust (or talk much at all, for that matter), so a decent amount of what I know about his experiences come from that book. There were of course some things left out, such as his wife and daughter, who never made it. My uncle once asked him what he did when he found out his wife and daughter were killed. He shrugged and said, “I went back to work.” Because mourning would mean death for him as well. Instead her persevered, and lived long enough to see his great-great-grandchild. Not long ago he was watching some great-grandchildren run around in his son’s backyard. “They didn’t win,” he said with a smile. Mayer Lachman passed away exactly one year ago, at the age of one hundred and five. A sick child who doctors didn’t think would live beyond his first year had lived through two world wars. The anniversary of a loved one’s passing is a time to reflect on life, and celebrate their legacy. I suppose that’s why I’m writing this. Hello, dear readers. You may have noticed that I have not posted much lately. That’s because I’ve been busy. Both my blog and book writing has fallen by the wayside, due to adjusting to taking care of my newborn daughter, finishing up law school, and a close member of my family getting hospitalized due to major health issues. Now, as I study for the bar exam, I am still writing, though at a snail’s pace. The second Spark book is over halfway done, so there’s that, and I’ve fleshed out the outline for the third. I hope to begin writing more in earnest soon enough. Please just bear with me. Check out this review of A Spark Ignites from fellow blogger Avi Greenberger! 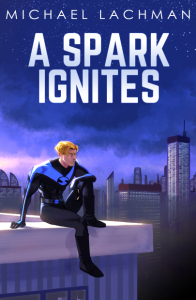 A Spark Ignites by Michael Lachman (of the fellow blog www.michaellachmanwrites.com, and previously of this guest post) is a superhero adventure and a the first step in a journey on Lachman’s writing career. Matt Stone is your standard teenager, facing high school troubles and a typical family life, including an annoying brother. But when Matt gets into a car accident and subsequently discovers the suit of “Spark”, New York’s superhero, will he take on the role and try to save the city? Or will the suit overwhelm him, leaving him to need the saving? This book is a solid read and a 7.5 out of 10, and can be purchased HERE. Check out J.B. Garner’s book review of A Spark Ignites! After some big meals down the gullet, we pull up a light novella of a meal with A Spark Ignites. A recipe spun up in a new contemporary superhero setting, it offers up a quick bite of superhero delight to enjoy. Considering my own preferences and inclinations, this should be a great meal … or will my taste buds be biased by my own preconceptions?